By Erin Dowd, Director of Curriculum for Level Up Village. Connect with her on Twitter @eedowd27. Level Up Village (LUV) delivers pioneering Global STEAM (STEM + Arts) enrichment courses that promote design thinking and one-to-one collaboration on real-world problems between students from around the world. Launched in 2012, LUV runs courses during school, after-school and in the summer for students at more than 150 U.S. schools, with 30+ Global Partner organizations in more than 20 countries. For more information, visit levelupvillage.com. Global collaboration is the next phase of 21st Century learning, but it can often be placed on the back burner. Let’s face it: finding the time to address all of the moving parts involved in connecting students across oceans is hard. But wouldn’t it be amazing to provide an opportunity for your students to learn with students half a world away and develop empathy by collaborating on the same project? And why aren’t more schools doing this already? Afterschool providers are under so much pressure to plan lessons and activities, meet healthy eating and physical activity goals, handle administrative tasks, connect with parents and more. It can be daunting to even contemplate a global collaboration, and inevitably, it slides down the list of priorities. Often, plans for a global collaboration are compromised by challenges such as spotty Internet connections, outdated software or lack of tech support. Different time zones are a major factor to consider and can prevent real-time connections. Global collaboration is similar to regular classroom collaboration in that it requires curiosity, effective communication, perspective taking, resourcefulness, and ultimately, the ability to follow through on projects. These are all important skills to be successful in life and are also highlighted in Common Core, NGSS, and ISTE standards. Global collaboration allows students to apply these skills across cultural contexts and allows educators to address many goals at once. While real-time video exchange is amazing, there are other ways for students to connect with peers across the world. Asynchronous video exchange, audio recordings, web-based tools, apps and social media are all helping to create meaningful global connections. 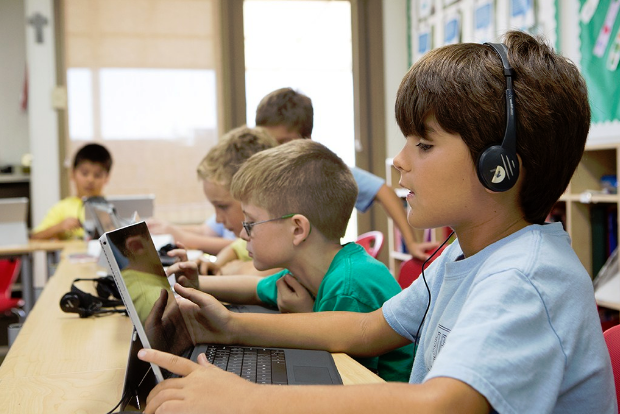 Not only do these technologies facilitate global collaboration, they also offer flexibility so students don’t have to stay up past their bedtime to take part. The success of a globally collaborative project should not depend entirely on the herculean efforts of a single teacher or afterschool provider. In addition to taking advantage of support offered by global education providers, teachers are working hand in hand with school technologists while actively growing their professional learning network (#PLN). Connecting with like-minded educators via social media and conferences can provide a spark to get started and an ongoing support system for those who are prepared to take risks that pay in dividends to students. So what kinds of global projects are kids doing? Students at St. Margaret’s Episcopal School in California co-designed and 3D printed solar-powered lights with partners in Honduras who live in an energy-poor community in their Level Up Village “Global Inventors” after school club, as reported by PC Mag. The Wonderment app engages children in real-world challenges and invites them to respond through pictures, videos or text, leading to cross-cultural collaboration and even philanthropic projects such as the launch of a mobile library for children in Guatemala. After connecting with a classroom in Bulgaria via Mystery Skype, students in Long Island used Buncee, a presentation tool that makes it easy to insert text, images, video and audio to share more about themselves. Touchcast is being used to create interactive science-based presentations that students can then share with students in other countries via GlobalCoLab. Padlet allows students to create a “virtual corkboard” with mobile devices and post a variety of content such as images, text, documents and videos to share with partner classrooms. Students thrive in environments where they are engaged in authentic experiences with other students – both inside and outside their physical classroom. Innovative and meaningful global learning experiences are not only within reach, but are rapidly becoming the norm at schools around the world.